An executive of a renowned security software company admitted that there is “no silver bullet” to combat the increasing prevalence of cyber attacks during a conference at the Holiday Inn in Makati last Mar 13. 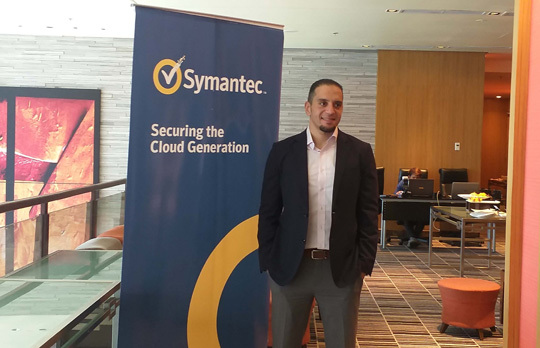 Symantec Vice President, Asia Pacific & Japan Sales Engineering, Sherif El-Nabawi smiles for the camera beside Symantec’s annual Internet Service Threat Report (ISTR) tarpauline. Symantec Vice President, Asia Pacific & Japan Sales Engineering, Sherif El-Nabawi, stated that this is so as he enumerated the innovative ways cyber criminals nowadays exploit both businesses and consumers. “There is no silver bullet,” El-Nabawi said. Last year alone, more than 70 million records from companies were leaked due to misconfigured s3 buckets in the cloud. “Cloud is the new PC. You’re gonna hear data leakages in the cloud more and more,” he added. Next is the whopping 78 percent increase of supply chain attacks in 2018 due to the malicious PowerShell scripts instigated by hackers. Symantec blocks 115,000 of these PowerShell scripts each month with its three-layer advanced detection methods such as Managed Endpoint Detection and Response service, the improved EDR 4.0 technology, and the AI-powered Targeted Attack Analytics. The Internet of Things devices, according to Symantec, remained in high vulnerability (90 percent) with infected devices such as routers and connected cameras a hotspot for cyber criminals. Despite the drastic increase of cyber attacks, he assured that both consumers and businesses alike can implement necessary security measures keep cyber attacks at bay. For businesses, he advised to have a “response readiness plan” in which a company will implement a multi-layered defense system and instigate a cyber attack on the system itself to test its weak spots. “Have a response readiness plan. Test this plan. Do a cyber attack in your organization. Measure the efficiency, capabilities, to utilize latest attacks to be able to run those exercises,” he emphasized. For consumers, he advised to change the default passwords for routers, devices, and update their operating system because it leaves them vulnerable to cyber attacks. As parting advice, he said that both companies and consumers need to back up their files. “Back up, back up, back up. Always back up your files whether on the cloud or on the physical (desktop) just in case,” he said.